Want more fantastic giveaways? Simply go to the Bloggy Give-away hub here for another 1,000+ going on until this weekend. I love meeting new people. It was fun to visit her site and say hi. The winner is going to LOVE this book. 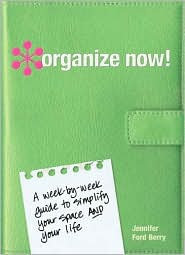 No more wasting time reading a "novel" to get organized. I the book I give straight forward advice and tips including checklist and lots of fun colors and design! Thanks Liza! I did it~ sounds like a great book! I left her a comment. Her book sounds wonderful! I suggested a tag. Thanks! I welcomed Jennifer. Thanks for the chance to win. I left a post on Jennifer's blog. Sign me up. i left her a comment. her book should be good. looking forward to it. I left a comment. Her book looks great! I welcomed her. Thanks for the giveaway! I commented on Jennifer's blog and also bookmarked her site, so I can get back there later! I left a post on Jennifer's blog. She has a great looking blog! I blogged on the intro post & I also subscribed to her RSS feed. Love organizing blogs! Left a comment for her..what a great looking book. I'll have to check it out either way. Thanks for the giveaway! I left her a welcome comment. Thanks for the great giveaway!